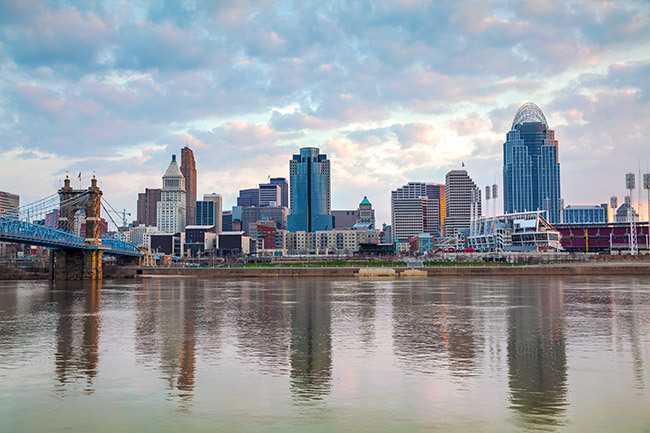 Located at the intersection of Ohio, Indiana and Kentucky, Cincinnati has long been a major center of trade for the American Midwest and South. This commerce has provided the market for dozens of other industries, ranging from automotive parts production to architecture to financial services. 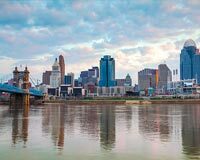 In this way, Cincinnati and its surrounding metropolitan areas have grown into one of the most vibrant and important economies in the United States. ExpeditedFreight.com keeps that growth going, providing businesses in and around Cincinnati with the supplies and delivery services they need for success. Cincinnati’s businesses have long faced serious logistics challenges, which carriers have endeavored to address. The problem is that many of these companies operate in industries that require both maximal shipping safety and rapid deliveries. Take the local auto supply industry. Cincinnati is an important center for manufacturing automotive control panels and other critical vehicle parts. But if those parts are even slightly damaged, the vehicles they go into won’t work properly, and may even put drivers in danger. So carriers need to take every precaution to prevent damage on the road— but because of auto suppliers’ pressing deadlines, they can’t let these precautions get in the way of quick shipping. Other Cincinnati industries have similar needs, creating a logistical nightmare for trucking companies. To resolve these logistical issues and provide local businesses with all the supplies they need on time and intact, ExpeditedFreight.com has developed a proven shipping strategy. Superior Safety - ExpeditedFreight.com provides dedicated trucking, meaning we devote a vehicle to your goods and no one else’s. This allows us to load specialized storage equipment that can consistently prevent any damage to your orders. We also assign two drivers to each truck that has to cross more than a minimum distance, so that both drivers have a chance to rest. Combined with careful route planning, these measures all but eliminate the risk of shipping damage, ensuring that your supplies arrive in good condition. Extensive Networking - The ExpeditedFreight.com coverage network extends through major metropolises, states, and provinces across the US and Canada. Thus if you’re delivering into Cincinnati, we are virtually guaranteed to have vehicles near your starting point, allowing us to begin shipping as quickly as possible. Likewise, if you’re shipping out of Cincinnati, we’ll have personnel and vehicles along the path to your destination. This lets us respond to breakdowns and other contingencies as quickly as possible, keeping delays to a minimum. Customer Support - Our customer support team is on the job 24 hours a day, 365 days a week. If you want to place a new order or get a free quote, they will be happy to oblige you. Likewise, if you’re wondering where your order is and when it is likely to arrive, our support team can pull up tracking information and answer your question precisely. To learn more about ExpeditedFreight.com’s services into and out of the Cincinnati area, visit our website today or give us a call at (513) 322-1100.